Christmas is a magical time around the world, especially in the picturesque Spanish city of Barcelona. The Catalan city embraces all the aspects of the Christmas season, celebrating for weeks in December, and long into January. The Christmas season starts in Barcelona at the end of November, when festive and joyful Christmas markets start to pop up in all of the city’s neighbourhoods. The largest of the markets is the Fira de Santa Llucia, which is located in the Plaza de la Seu right out front of the historic Barcelona Cathedral. Shop here for traditional decorations, handmade crafts, and unique presents for your friends and family back home. One traditional Christmas item you’ll find widely available here is the “Caga Tio”, which is a small log which has a face painted on one end. Over the Christmas holidays, local children will pretend to feed the log treats and they will keep it warm and cared for by snuggling the log in a red blanket. Then, on Christmas Eve, children will magically find treats and toys hidden inside the blanket! 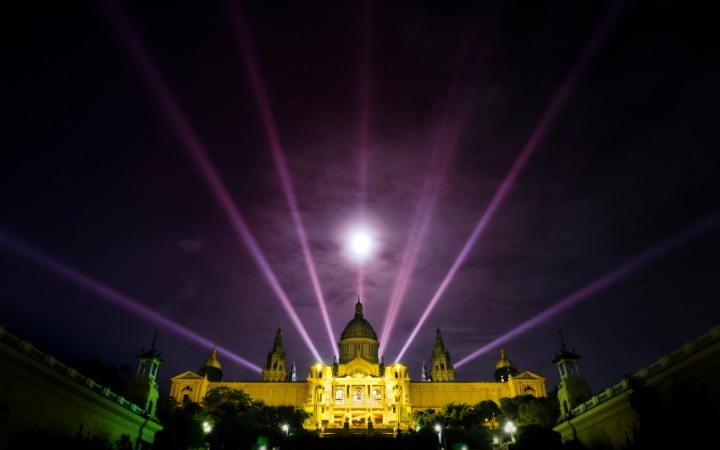 Another early sign of the season in Barcelona is the city’s sparkling Christmas lights. Lining the popular Las Rambas, decorating the port and the crowded Plaza de Catalunya; these Christmas lights give the medieval city a truly festive flavour. While you are wandering the popular streets of the city, including Las Ramblas, make sure to find some traditional Christmas treats to nibble on. Traditional Spanish turron are made of nougat and almonds, and polvorones are another treat made with almond paste. Make sure to sample El Roscon de Reyes, a Christmas cake baked with surprises inside. One surprise is the figure of a king, the other is a bean. If you find the king in your slice of cake, you are entitled to be king or queen for the day. Watch out if you get the bean though. You may be expected to pay for dinner! You can also find beautiful Nativity scenes all across the city; the largest found in the Placa Sant Jaume. In this region of Spain, Nativity scenes usually include a replica of the city of Bethlehem, including the traditional manger scene and other Biblical stories such as the three wise men. Keep your eye peeled for the Catalan Nativity figure known as the Caganer. He has been a controversial tradition since the late 17th century. The Caganer is a small figure set off somewhere away from the manger, caught in the act of going to the bathroom. Traditionally, children are asked to find the Caganer, although there have been recent moves to have the character banned. Plan to stay in Barcelona until early January, for the city’s Three Wise Kings parade. The three Wise Kings arrive in Barcelona’s glittering harbour on a boat, greeted by crowds of cheering and applauding children. Then the kings, the crowds and dozens of colourful floats parade through the city, and all the children get their holiday presents.